The label on the back of this photograph contains the following description: "The mechanical icing machines of the Santa Fe at work on a potato train in the Argentine yards, Kansas City. One car can be iced in approximately 30 second by these mechanical marvels, thus helping to speed the valuable produce eastward to market." 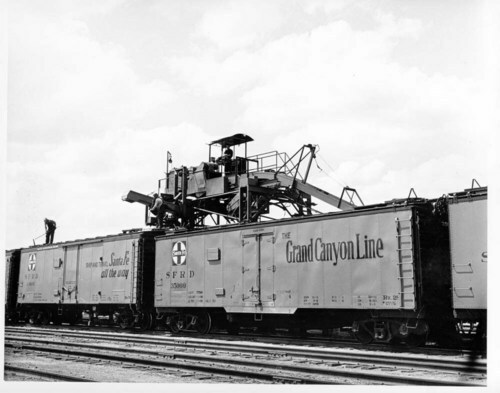 The cars in the photograph contain the Santa Fe logo, SFRD (Santa Fe Refrigerator Dispatch, a subsidiary of Atchison, Topeka, & Santa Fe Railway Company, and Grand Canyon Line. The photograph was taken in the Argentine yards by Frank E. Meitz.